In June, I asked our readers to take a survey to let me know what you thought about the news posts. The results were very insightful and helpful. Thanks to the 35 people who provided feedback through the survey. Below is a summary of the responses and some of the actions I am taking based on those responses. Almost everyone (97%), said that email was the way they first saw the news posts. Most people (88%) thought the news posts are valuable, with 9% classifying the posts as somewhat valuable and only 3% saying they were of minimal value. No one thought the posts were of zero value. Those numbers were encouraging, because it takes a lot of time to do all these news posts so I am glad you are finding them useful. When asked how many times a week you thought was the ideal number of news posts, 54% said 1-2 times, 23% said 2-3 times, 3% said 4-5 times, and 20% said no regular schedule. Most of you (71%) wanted to receive an email with the news post on the same day that the post went live on the website, while 29% of you wanted to receive a weekly email with all of the news posts from that week. Typically, I have enough information to do at least 2 posts a week without having to combine topics. Having individual posts that cover only one topic allows people to more easily share the posts they are most interested in telling others about. This is especially important for the workshops, schools, etc. who may use the news posts on the KSBA website as a place to refer potential attendees. Based on that background knowledge and your responses, I am going to continue to think of 2 posts / week as the normal rate with a third post on busier weeks. (I say that realizing that some months it seems like “busier” is the normal, not the exception.) However, I recognize and appreciate that some of you would like to receive the emails less frequently, so I have created an option for you to receive the emails on a weekly basis. Click on “update your preferences.” You will be taken to a page with your preferences. It’ll look something like the picture below. You can change or update any of the information on the page – the only required text is your email address. 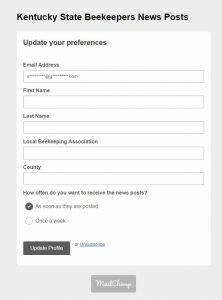 You can also choose whether you want to receive the email as soon as the news post is posted on the website or once a week. All you have to do is check the appropriate circle and then click update profile. The vast majority of you (86%) had no preference for the day(s) of the week that you received the news post email. Of those who had a preference, Monday, Wednesday, and Saturday each received 9% of your vote; Tuesday and Sunday each received 6% of your vote; and Thursday and Friday each received 3%. Based on these responses, I’m going to make Saturday and Wednesday our “normal” post days with Monday as our “extra” post day. Those of you who choose the weekly option will get your emails on Wednesday. Announcements that this month’s BeeLines is online. Profiles of beekeepers throughout the state. Information about national or regional,programs related to honey bees and beekeeping (for example: CRP, essay contests, etc.). However, even these topics scored relative high with scores of 3.05 and 3.28, respectively, on a scale of 1-5. I created a table of results if any of you want to see more details about how each of these topic ranked. Many of these topics are ones that I’ve also thought about and have been trying to come up with a way to include in the news posts. The challenge for me is that researching and writing the news posts is outside of my duties as KSBA webmaster and is something that I do on a volunteer basis because I think it is valuable. However, like everyone else, I only have so much time to volunteer. Unfortunately, I’m pretty much maxed out right now so even though I want to cover some of these other topics, I just don’t have the time. If any of you would like to volunteer to help write some of the news posts, I’d be happy to have the help and maybe that would give one of us the time to cover some of these other topics too. Until then, I’ll keep these topics in mind for future reference and will try to work them in if I can.